There are some serious storm clouds hovering over this summer's earnings season. A slew of international developments are brewing (or boiling), to create a lot of investor uncertainty. "There's not a lot of optimism going into this earnings season. I think the bar is low overall," says Michael Block, chief strategist at Rhino Trading Partners. 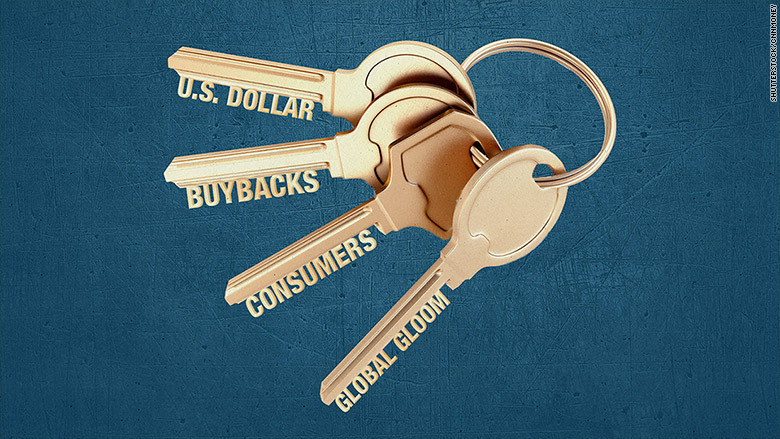 Four things could dominate the earnings conversation: global gloom, the U.S. dollar, consumers and stock buybacks. Will China and Greece spill over? : American Investors and policymakers are stressing about Greece's default and China's stock market crash. American businesses don't have a lot of exposure to Greece, but they are vulnerable to the situation in China. Either way, investors worry that the U.S. could be hit by some kind of domino effect. "You have some psychology that plays in: Whenever the world gets scary, people tend to clam up," says Joseph Halpern, CEO of Exceed Investments. "It doesn't make much of a difference that Greece has a very small economy, and Greece shouldn't affect us. It's just scary stuff out there." Summer spenders: The American consumer didn't spend much in the first half of the year, but experts expect that to change in the second half. Consumer spending finally picked up in May to post the best monthly increase since 2009. The question is whether that momentum will continue. Low gas prices could save the average family over $700 this year, according to the Labor Department, and the hope is that shoppers will spend some of that extra cash. But Halpern says that Greece and China could make people reluctant to shop. The U.S. dollar dilemma: The dollar has been strong throughout 2015, which is longer than most experts anticipated. And that strength is likely to lead to a 3%-4% decline in total revenue for the S&P 500 in the second quarter, according to Barclays. It's a double edged sword. Some U.S. retailers such as Target (TGT)and Walmart (WMT) generally benefit from the dollar's strength, since importing goods less expensive. But major multinationals like McDonald's (MCD) take a hit when their global profits are translated into much stronger U.S. dollars. The strong dollar also makes U.S. products like cars, more expensive for foreign buyers. A year ago one dollar was about 1.36 euros. Now it's 1.10 euros -- a major shift for the world's two big benchmark currencies. Buyback Baloney: Companies are increasingly buying shares back from investors. In theory, this is suppose to reassure investors that the company is confident about its future. But some say it's a gimmick companies use to hide a lack of sales growth. "Companies will continue to try to juice their stocks," says Block from Rhino Trading. The gimmick is working though. Companies tend to see bigger stock gains when they announce buybacks at the same time they report earnings, according to Barclays, so expect to see more of these announcements in the coming weeks.